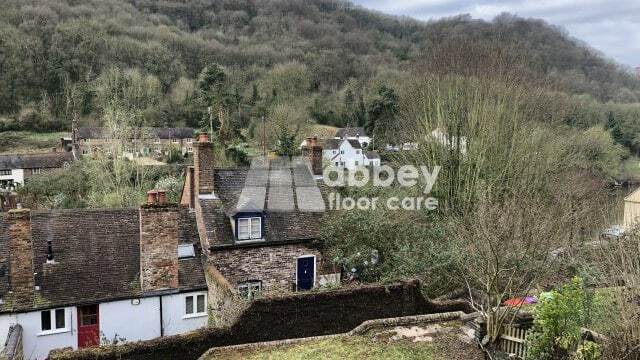 This is a two-day Terrazzo Polishing Project in Ironbridge, Shropshire, known as the birthplace of the Industrial Revolution. The Terrazzo tile floor was over 50 years old and was in reasonable condition for its age. As with many old Terrazzo floors, the floor had a few issues for me to resolve. There was a lot of lippage across the floor. Lippage is a term used to describe differences in elevation between the ages of adjacent tiles. Most of the lippage was under two millimetres, but there was a lot of it. However, in a few places, the lippage was around four millimetres. The floor was not flat, and it was slightly undulating. The terrazzo finish was grimy and well worn. There were lots of areas of missing grout that needed filling. I originally quoted for a mid sheen finish. 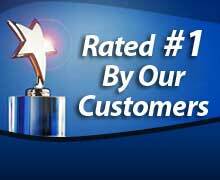 After talking to my customer’s wife, it was apparent she wanted the Terrazzo polished to a highly reflective shine. Before starting any restoration, I installed a plastic sheet around the room to stop any splashes from the grinding process going onto the walls. I started grinding the floor with 30 grit metal diamonds and my heavy-duty floor grinding machine. 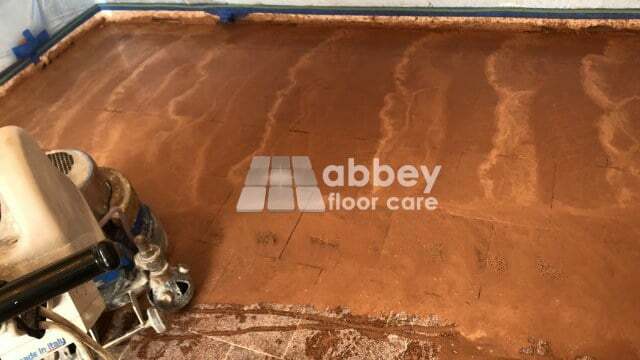 This tooling is designed to remove a thin layer from the surface of the Terrazzo on each pass. 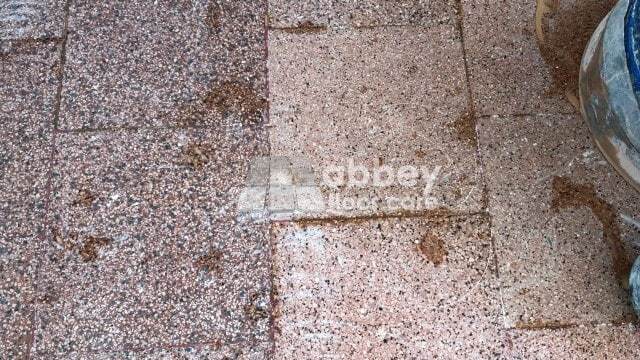 In most cases, two or three passes of the grinding machine will remove the lippage and level the floor. However, I had to make six passes on this floor to remove most of the lippage. I had to be careful as I didn’t know if the tiles were all Terrazzo or Terrazzo coated cement tiles. Next, I use transitional copper and diamond resin tooling to remove the scratches made by grinding, preparing the floor for honing. Before finishing day one, I coated the floor with a densifying chemical. A densifier toughens up the cement in the terrazzo and helps improve the final shine. I started by filling the missing grout with a Reddy Brown resin filler. In the end, I had to fill about two-thirds of the floor. While waiting for the resin to cure I ground and honed the floor edges using an electric hand grinder and hand polisher. 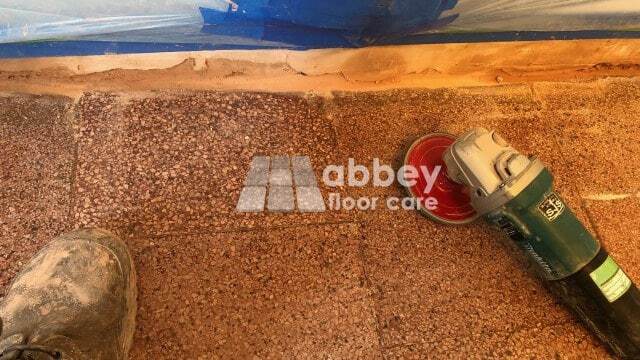 My large grinding machine grinds a floor to five millimetres of the floor edge. My client had removed most of the skirting boards. So I only had to grind and hone the edges of the floor around the window area, a cupboard, the doorway, and some radiator fittings. The edge grinding and honing work took me about three hours. If I had to grind and hone all the edges, the work would have taken a full day. After finishing the edges, I use the final transitional diamond tooling to complete the honing stage and remove the excess resin of the floor. I started the polishing stage with 400 grit resin diamond tooling, followed by 800 grit resin diamonds. Unfortunately, I noticed a couple of areas with scratches remaining from the grinding stage. I finished the resin diamond polishing with 1500 grit diamonds, leaving a high sheen finish. I used fine polishing powder to give the floor a deep lustrous gloss. Finally, I applied a high quality impregnating sealer. 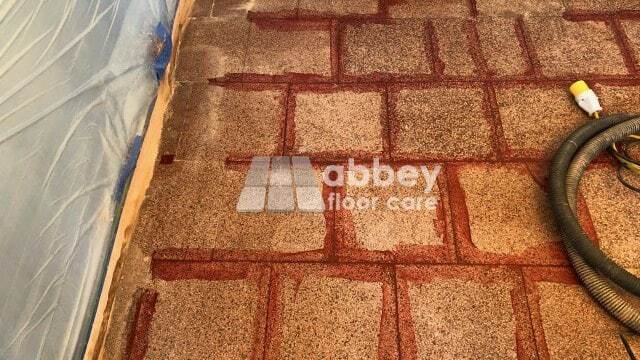 An impregnating sealer helps protect the floor against spills and makes a stone floor easier to clean. My client and his wife were absolutely delighted with the finish. I explained to my customer that the sealer will not offer protection against acids spills. I also explained the importance of dry sweeping and damp-mopping the floor regularly with a Terrazzo floor cleaner. 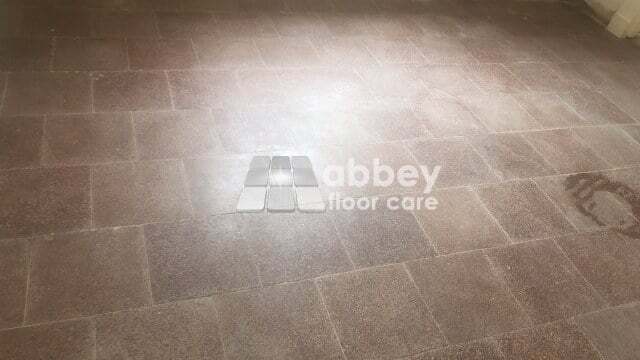 Standard floor cleaners can be too acid or alkaline, and repeated use will damage a Terrazzo floor finish. 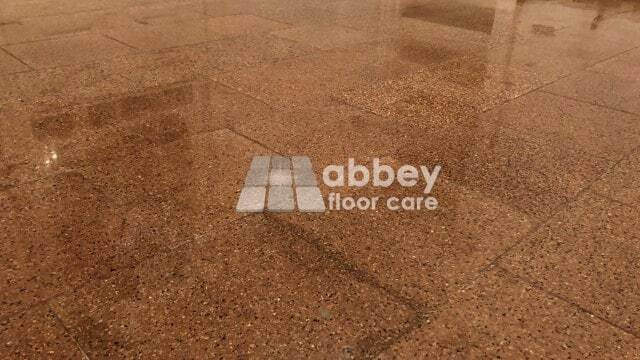 A Terrazzo floor clean contains additives that help to maintain the finish and the impregnating sealer. 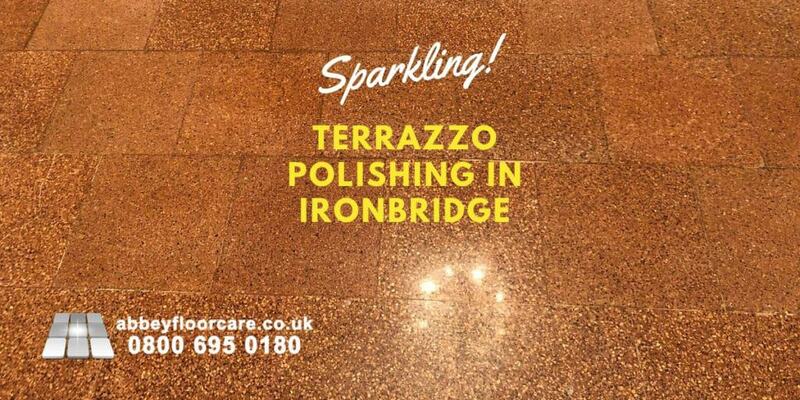 If you are looking for a Terrazzo Polishing Service or help with store floor restoration, please drop me a line. I’ll be happy to help. Thank you. Rather listen than read? Click to play the video below.